Eliminall Spot-On For Small Dogs is for the treatment and prevention of fleas, ticks and lice infestations on dogs weighing between 2kg and 10kg. 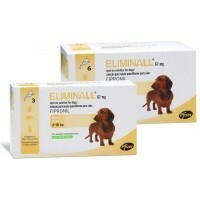 Eliminall Spot-On will kill any fleas within 24 hours and any ticks or lice within 48 hours. Please note that some species of tick may not be killed within the first 48 hours. Developed with Fipronil, the treatment will remain effective for up to 8 weeks against new infestations of fleas, but to ensure this cover is 100% effective, it is recommended that a new application is applied every 4 weeks. Eliminall can also be used as part of a treatment strategy for Flea Allergy Dermatitis (FAD) where it has been previously diagnosed by a vet. Do NOT use on puppies less than 2 months old and/or weighing less than 2kg.